Each Spring and Fall is our Weekend Getaway Retreat. 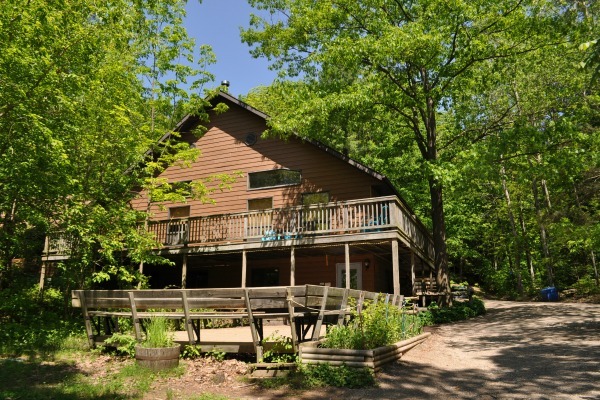 They are held at the Mansfield Outdoor Centre, near Barrie, 1 1/2 hours north of Toronto. Join us to experience the harmony, peace, and balance that yoga brings in a setting that invigorates the body and calms the mind. No previous yoga experience required. Everyone is welcome! During free time we will be organizing outdoor activities depending on weather and the season. See below for more information about the program of activities. *Satsang: group meditation, chanting, lecture and prayers. What to bring: Please bring your own Yoga mat. Please bring your own towels, pillow and sleeping bag or blankets. Linens are not provided. We also recommend: shawl or blanket for meditation, flash light, casual & warm clothes, and shoes/boots for hiking. Accommodation: Each room can accommodate 4 people. From Toronto: Take highway 400 northbound to the exit at Highway 89 (Cookstown), proceed west on hwy 89 through the towns of Cookstown and Alliston until you meet Airport Road (Dufferin County Rd 18) Turn right (north) and go approx 6 km through the small town of Mansfield (set of lights) then keep going another 3 km (approx. ), you will see the sign for Mansfield Outdoor Centre. Turn right into the driveway and look for the sign “Field Centre” and turn left into the parking lot. From Barrie: Take highway 400 southbound to the exit at highway 89 (Cookstown exit), proceed west on hwy 89 through the towns of Cookstown and Alliston until you meet Airport Road (Dufferin County Rd 18) Turn right (north) and go approx 6 km through the small town of Mansfield (set of lights) then keep going another 3 km (approx. ), you will see the sign for Mansfield Outdoor Centre. Turn right into the driveway and look for the sign “Field Centre” and turn left into the parking lot.